Our advanced face-to-face training course management system is fully integrated into the SkillGate LMS and all its features. 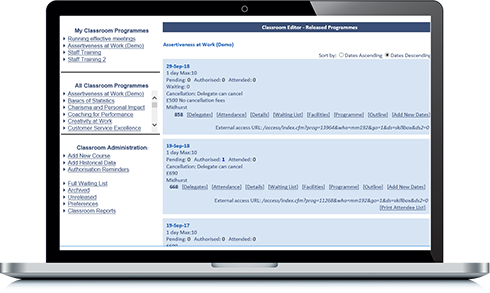 There is an events diary option and many classroom management features allowing trainers to customise the distribution, authorisation and booking procedures for this type of programme. Face-to-face courses can be seamlessly integrated with your Library, My Plan, Objectives, Traffic Light and SkillBuilder blended programmes. You can use it to create courses and market and sell them to third party individuals or organisations.